Carlo Borromeo was born in Arona on 2 October 1538. The fortress where his family lived in that period, that stood on the top of the hill behind the town, was destroyed by Napoleon in the early 1800’s, therefore only its ruins are still visible today. They say that just before his mother’s delivery, a miraculous light appeared in the sky that invaded, up to sunset, the so-called “room of the three lakes”. His father Giberto II and his mother Margherita Medici of Marignano were lords of Arona and of several other towns by the lake. At the age of seven Carlo joined the Church and when he was only 12 he became a commendatory abbot for the ancient Benedictine abbey of Arona, once connected to the present church of the Saint Martyrs. He later began his studies of Canon Law at the University of Pavia, where he graduated in december 1559. After the degree, Carlo went to Rome following his uncle Giovanni Angelo Medici of Marignano, who had been elected Pope under the name of Pio IV. 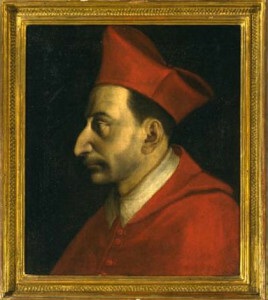 Carlo was appointed a Cardinal Secretary of State at the Vatican. The Pope appointed him Archbishop of Milan on 12 May 1564, so he moved there. In Milan he worked hard to re-establish discipline in the clergy. He was so interested in the wellness of the people, that he wanted to build many hospitals and charitable institutions. He was also very close to the inhabitants of Milan during the famine of 1569 and 1570 and above all during the “plague of Saint Carlo”. He went far from Milan only during his many visits to the towns and villages of his diocese, even the furthest ones. The faithful loved him, but he also had several enemies, above all among members of some religious orders who had lived a certain freedom up to that moment. The deep reform of the order of the Umiliati, for example, even led to an assassination attempt to which the saint miraculously survived. The year 1584 was particularly hard for Carlo: hard work, poor health, penances, forced fasts… His last travel to Ascona was fatal: on his coming back to Milan, on 3 November, he died. Since it happened after sunset, his death was registered on 4, which is still his feast day. Pope Paul V canonized Carlo on 1 November 1610.